A couple of months ago I was asked to write a blog for 9Spokes, the amazing providers of the Business App Dashboard, it was such a pleasure and a privilege to write for them, knowing their commitment to small business and their clear mission to assist in the engagement and productivity of this sector. Two drivers in my life too, along with my desire to reduce loneliness in self-employment/freelancing. This blog is devoted to the subject of “building community” around a product or idea. An insightful brief to help businesses engage better around the transactional goals they hold. Now, more than ever we all need skills to create, build and nurture Community in our businesses. Since the late 90’s it has been possible to build online communities and the obsession with it has grown each year. Ecademy, to my knowledge was the first social platform to enable this, called ‘Clubs in early 2000’s’. Since then Facebook and LinkedIN have made community building as a task relatively easy to set up. Twitter #tags also enables instant community conversation around a topic. What lacks within some is the culture and skills to make a community successful. Building the ‘place’, adding a logo, writing posts within it, these can all be done as ‘head-based’ tasks. Running a community takes heart. I use the analogy of a pub. Anyone can run a pub, stock it with booze, provide food and issue a set of tasks to staff to deliver a service. It takes a special landlord to make you feel welcome loved and that you matter to them and the other pub-dwellers and ensure that you want to return again and again, making it your ‘home’. With the GDPR now well and truly here (General Data Protection Regulation) we are all going to need to build community. Our ability to write to strangers and hope for a conversion to a sale will be massively impacted. I have never been an advocate of this method of marketing and so I welcome this change. Those that will struggle will be the task based, process thinkers and do-ers, giving rise to the ‘people-based’ engagers. The naturally ‘social’ people within organisations that know it is better to create an environment where “people come to buy rather than you go to sell”. Bring on the Community Builders and Managers. So what does it take to build community? A place where people belong, feel loved, share in common values and thoughts and seek to raise one another rather than achieve their own goals alone. It takes a mindset of ‘us’. 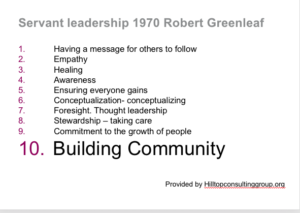 A leadership skill that is best studied in the teachings of ‘Servant leadership’ and the Self Actualisation of ‘Maslow’s ‘Hierarchy of Needs’ when we achieve level 5 and want to help and inspire others. To begin the process of community building, you must know your ‘WHY’. The reason you do what you do, sell what you sell and get out of bed in the morning. Then your “WHO”, who is it that you seek to serve and love. WHO else wants to do this, WHO else seeks to help the people you want to help. A common set of drivers, much like I have with 9Spokes. We all seek to serve the small business; we share the same values and intention, yet we do it with different products and services. We are collaborators. If you have a product or a service and you are passionate about the person who you seek to serve then you can be a Community Builder. Study the 10 features of Servant Leadership. Become a Leader, not a sales person, lead them with love, inclusion, diversity and openness; and as I said in my first quote of this Blog, taken from The Little Prince. “If you want to build a ship, don’t drum up the people to gather wood, divide the work, and give orders. Instead, teach them to yearn for the vast and endless sea” . Make sure you focus your thoughts and deeds on the vision you have and the view you want them to see, don’t focus your thoughts around the results and task, and never focus on a transactional outcome as that will stop people chatting, caring and loving you and most importantly, of loving each other. Mapping HOW to build community is impossible in such a small blog. I would be in danger of writing an article. However, if you would like to join The Business Cafe Global Group on Facebook that I run, hopefully you can learn from my example. 9Spokes are a sponsor of The Business Cafe and part of our ‘Making Business Digital’ strategy, so we have great synergy in our missions. I want to close in saying that the most powerful way to build a brand is to share your own journey, be open, vulnerable and be one of them. Leadership is not about being brilliant, being a guru or being looked up to. It is about all the people you seek to support and grow, they will value you more for your humanity and kindness and they will trust you for your weaknesses as much as your strengths. Be brave and be you, it is the best you can be. Finally, there are two awesome days in your life. The day you were born, and they day you discover why you were born. Building a community might just give you that day.